I’ve been experimenting some with fabric and paint and sewing this summer. Just playing a bit, having fun and not expecting much of an outcome because I didn’t know what I was doing. When you have no expectations on your creation if often surprises you. Both my experiments turned out really nice and I’m pretty pleased with the result actually! I painted with acrylics on cotton fabric one day and then kept experimenting on that surface. I’ve added other pieces of fabric using the sewing machine. 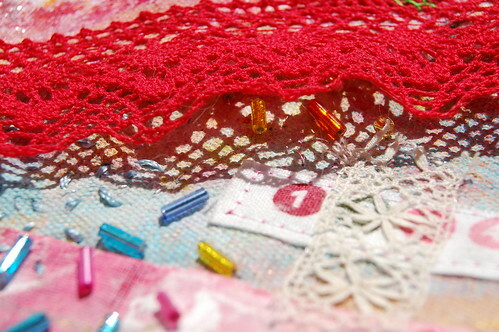 I’ve embroidered and drawn on the fabric too, and sewn on beads, buttons, lace, jeans and small bits of embellishments. What came out are two wall hangings that could be called Art Quilts or maybe Fabric collage. I’ve called these Summer Play Time Quilts! The second one is pinkish and turquoise. Buy this wall hanging at my Etsy shop! Sold. I’ve added both of these to my Etsy shop today as they are ready to hang as you can see. The hanger is a wooden stick that I’ve decoupaged with vintage text bits from a book and it’s also decorated with glitter tread, fake white roses and ribbons made into bows. Cool, eh? I hope you like them because I want to make more more more as usual. Nothing new under the sun, I’m a compulsive maker. You’re my inspiration! These are the first items I’ve added to the shop in quite a while because the activity over there has not been very wild. I was encouraged by two recent sells though. I sold one of the jeans bags (the one with the blue lining is still available!) and then also a softy called Skotty (I’m so happy he has found a good home!). It’s nice to make things, but one doesn’t want to be swamped inside the house with handmade items, so I’m glad to see them sail off. So if you have the time go check there to see if there is something you’ll like. Thank you! 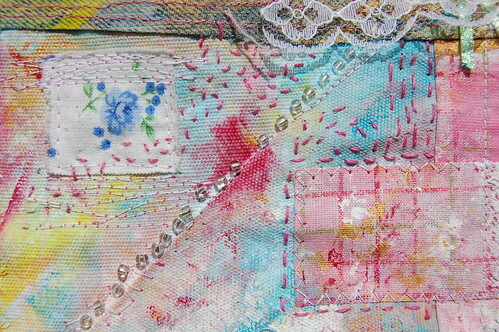 More close-up photos of the Art Quilts below. These are yummy, I wish I know where and how to print them into postcards! That’s all f-f-f-folks! I hope you’re having a playtime-full summer! 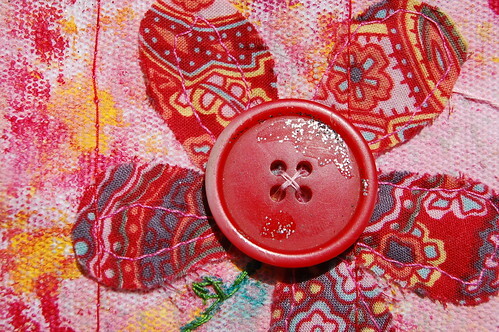 This entry was posted in Fabric Art, Quilting and tagged art quilt, embroidery, my art, sewing. Bookmark the permalink. Eye candy!!! 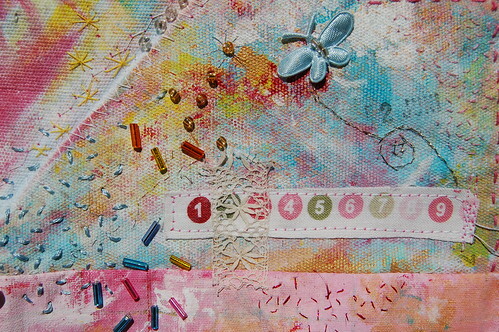 Love the colours and the embellishments! These are beautifully textured and the colors are so yummy! Inspiring! You can get postcards printed from your photos from moo.com and from cafepress.com. I haven’t tried either of them yet, but I have some friends who use CafePress to print and sell their work. These photos would make lovely cards! I’m having a very small giveaway on my blog–some beautiful skeletal leaves for collage or other papercrafts. Feel free to drop by and enter! 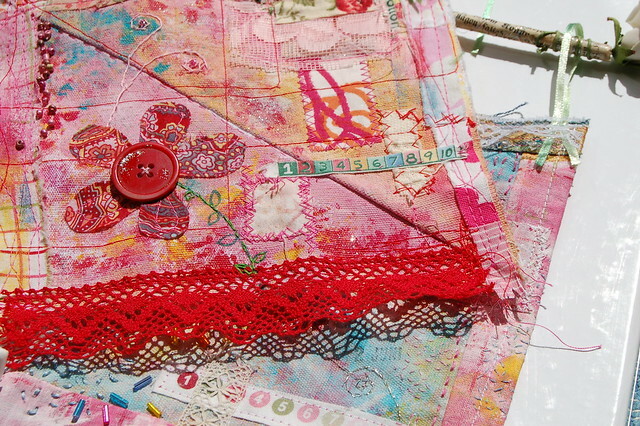 They are just beautiful…I’m usually partial to pink…but that red one is just gorgeous…. I’m not that good at commenting, though, – sorry! 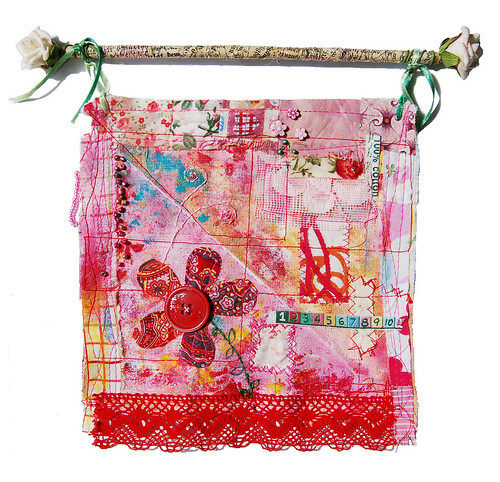 I just love these two art quilts, very summery and very girly in a way. But more … I do not know how to write it here, but they speak to me. I printed cards the other day on our (laset-) printer at home. I got the ticker paper, the cardstock, at the paper supplier. I had to look the printer up in the manual and put the preferences to “thick” and then choose a better print (more ink dots) than the “normal” setting does. I think the photos (thank you-crads) came out as well as at the print house, – I did cards there this spring. I found your blog today it?s lovely! I love your blog too. The colours are wonderful! I’ve awarded you a brilliant blogger award! Check my blog for what to do next. Those are beautiful! Love the colors and textures. This is really lovely ! 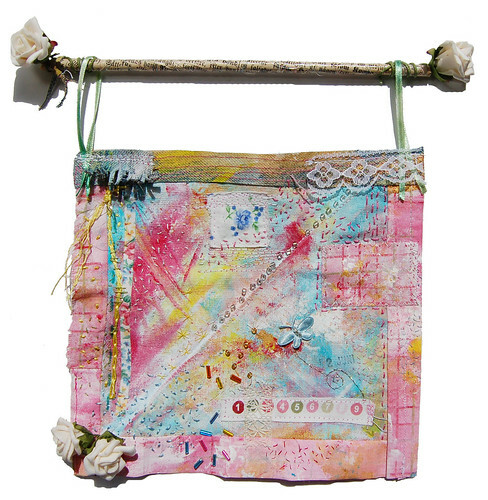 Very cute small art quilts…congrats for selling them! These are stunning, Hanna!! Beautiful! I especially love the one with the red trim ;-) Congrats on selling them!